There is a beer on the Australian market that drops its pants in the face of the traditional beer in order to gain attention. Described by one reporter as an anti-boutique, boutique beer Piss is the brainchild of Chris Hodges and his business partner Noel Fermanis who together run the Great Britain Hotel in Richmond, Melbourne. 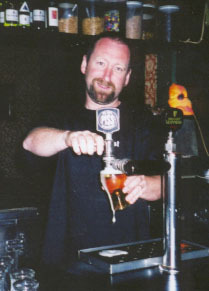 The beer was born in 1998 when a small Victorian brewer offered unlabeled stubbies as a way to promote the pub. Hodges describes the beer as similar to Carlton Cold and like its larger cousin is aimed at the 18-30 year old market that has yet to pledge their loyalty to one brand. The quirky brand shot to national fame thanks to becoming the official beer of the 1999 Melbourne Fringe festival. Yeah...but how does it taste? Well, we are happy report that this larrikin lager is not just a pretty name. The beer presents well with a golden colour and a creamy head that permeates a wonderful fruity aroma. Piss lager is a well balanced brew that combines a full body together with fruity aromas and an underlying malt flavour that stays with you a while after the brew slides smoothly from the palate. Don't be fooled by the marketing machine, Piss beer is a well crafted beer that stands up well against the other boutique beers with fancier labels. 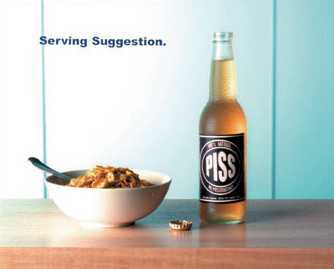 You're sure to generate conversation when you present Piss at your next dinner party or trip to the BYO. The full body and malt flavours lend the brew towards robust flavours such as a traditional roast, kangaroo and veal shanks. the sweet malt flavour also makes Piss a good beer to enjoy at the end of the meal with dried fruits and sweets. if this does not entice try the manufacturer's serving suggestion below...or are they taking the Piss.